Cailey and Millena, students of Southridge Elementary, presented Larry Shareski with an iPad during their last assembly of the school year on June 14, 2013. The students visited Semiahmoo House Society a couple of months prior as part of their research project on inclusion. While they were here, Larry recognized their uniforms and informed them about his connections with the school. He then conducted a tour of The Treehouse and introduced them to people. Afterward, Cailey and Millena were inspired to organize a fundraiser in front of Price Smart Foods and donate the proceeds toward the purchase of the iPad. They raised a good portion of the money but not enough to cover the entire cost. 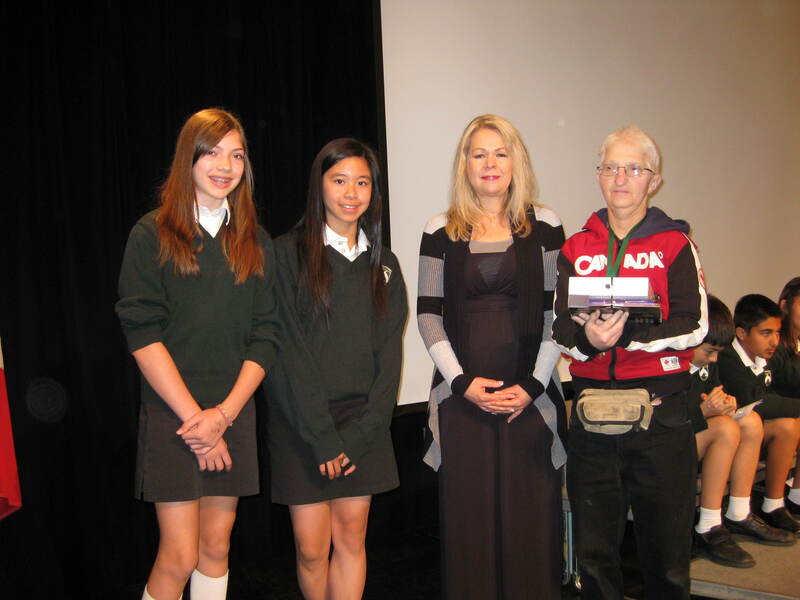 Their teacher, Mrs. McNeil, topped off their donations by accessing funds designated to Grade 7 Legacy. She then purchased the iPad and a heavy duty case. Just before presenting their gift to Larry, Cailey addressed the assembly and said, “During our visit at Semiahmoo House Society, we learned that people with developmental disabilities are just like the rest of us.” Great thinking, Cailey and Millena! The iPad will be shared among the Society’s participants to help them communicate and learn about Internet technology. Cailey and Millena, thank you for learning about us and for your philanthropic actions! You have given us so many gifts. The iPad will significantly impact the people who will use it. We also appreciate your organizing a fundraiser to increase awareness about our Society and advocating for an inclusive community with your school mates. Mrs. McNeil, thank you for being such a great and generous teacher. This entry was posted in Blogs by Louise Tremblay, Inclusion, Philanthropy, Uncategorized and tagged creativity, developmental disabilities, diversity, inclusion, philanthropy, self-actualization by The Semiahmoo Foundation. Bookmark the permalink.